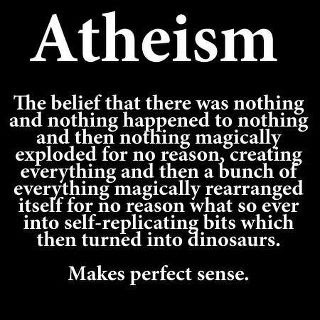 Makes as least as much sense as an invisible omniscient omnipresent being creating everything out of nothing on a whim. No, in fact it makes more, since it even though the statement is a profoundly over simplistic generalisation the theory it mocks is backed up by repeatable observation and experimentation. Y'know, freaking actual science, something I bet the authors and propagators of this piece have little useful understanding of. Anyone who argues "Evolution is just a theory anyway" usually needs to brush up on the scientific definition of "theory". It is a bit more strict than the common one. I have no general issue with religion, I really don't, but when it gets all "scientists, what do they know?" anti-science like this (aside from the literally holier-than-thou "my sect is better than your sect" BS that screws up everything it touches), it really pisses me off. Science and religion can co-exist, if only the fundies will let them.